Does anyone know what this concrete structure is? It's right next to the train station (http://www.alpsroads.net/roads/ny/rochester/lvrr.jpg) so my guess is the tracks came in on that structure. To me, it looks like the tracks stub-ended underneath and the concrete structure was for pickup and deliveries of passengers including via taxi and trucks with express freight. But, without an old photo to go by, I can't say whether either Alps or myself is right. That's from an old postcard - appears that the left side (where your concrete structure is) was a building foundation and trains came in somewhere else. A little hard to tell, though. If not, are the differences in shield styles a contractor, issue, a district issue, or something else? I hope it's a contractor issue, but it's definitely a NYSDOT problem, nothing to do with town-maintained routes. Couldn't tell you if it's regional or not, but I've only seen that first style upstate. the 36 and 63 are an older standard, and the 15 and the 256 with it are a newer one. the 256 with the 36 and the 63 is non-standard. must be a contractor flaw. 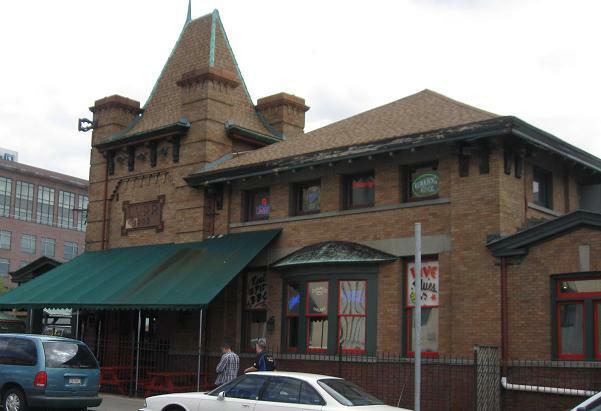 That train station is now a Dinosaur BBQ restaurant. Both of those shields I have seen more than just a few times. I am starting to think its not a contractor issue rather than it being the new type of shield. I hope I am wrong at this because its hideous IMHO. The hump in the 63 and 36 shields are too short and the hump in the 256 is too wide. New York is consistently inconsistent anyways (to quote Doug Kerr). The assembly is on Bridge Street north at Exit 17 of I-690. Perhaps "TO I-81", as I-690 West does go there. It would make sense, considering I-481 and NY 290 are also mentioned. edit: Because I forgot how to trim the size of your obnoxiously large photo, I simply replaced it with a link instead. I'm about to go find out how to make it smaller . . .
double edit: add "width=800" inside the img tag. Was just looking at my 1965 Rand, and the Syracuse inset shows New York 415 heading north from New York 290 near the intersection with Bridge Street. Could this be the missing shield? New York 415 was assigned to U.S. 15's alignment in 1974, so this answer may be a stretch as well. Um, shields are a little new for that. 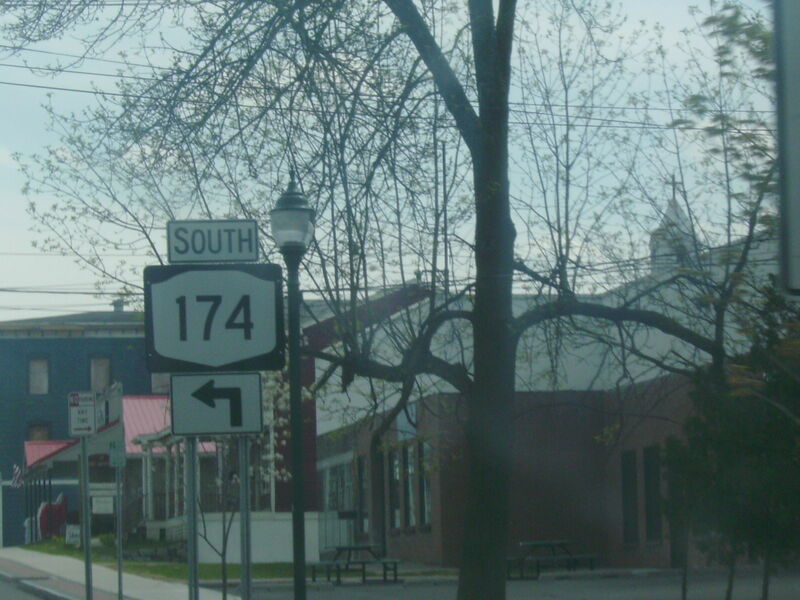 NY 415 has been decommissioned for sometime in Syracuse. It is now Onondaga CR 77, so really not much of a chance. How far was John Glenn Boulevard supposed to extend eastward? I see on aerials that it ends at Buckley Road, but grading continues a bit further north to Morgan Road. Several printed maps also show it as completed between Buckley and Morgan Roads, but that is certainly not the case in reality. Also, is Onondaga County 57 the only county route signed within the county? I read that the original end of Interstate 690 involved turning onto Interstate 90 at a traffic light. I can see the trumpet interchange footprint on this aerial. Was the traffic light at the end of the ramps, or with New York 48, or somewhere else? 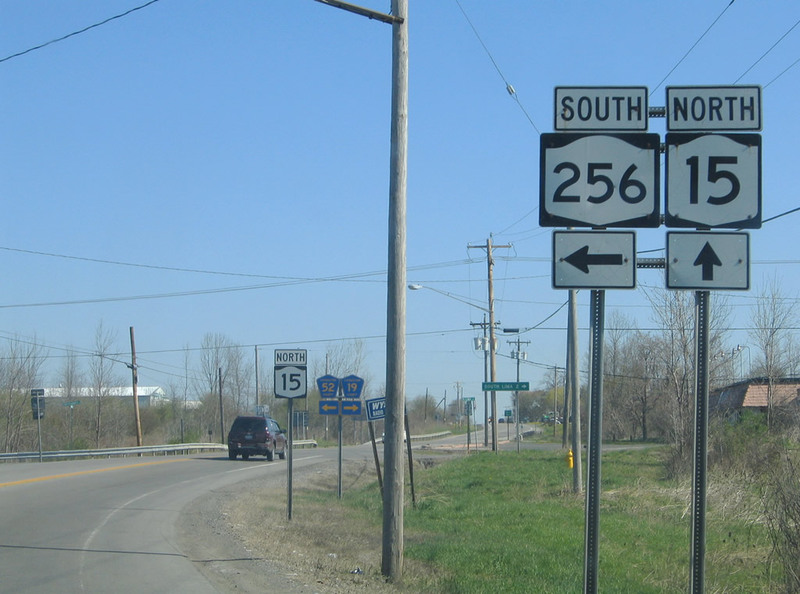 I can tell you for sure that Onondaga County Route 57 isn't even signed right - Its signed so no one got confused with the decommissioning of NY 57. Its internally Onondaga County Route 91-2 or 91B for the layman. The others I am not so sure on. I had always figured that John Glenn Boulevard would have connected with NY 481. I don't have any concrete evidence, but I always guessed it could be the case. Also, on another 481 note, I believe that the end of the NY 5 expressway in Fairmount(at Wegman's) could have connected to the current end of 481 at 81 south of Syracuse. Again, no concrete evidence. Just a thought. If those two thoughts of mine are correct(please, someone let me know if I am on to something), those two projects together would have created a full loop of sorts around Syracuse. 481 to 5 to 695 to 690 to John Glenn Boulevard back to 481. Snappyjack is correct on John Glenn Blvd. A regional transportation plan from 1971 (which I found at the SU library) shows the plan was to extend it north to meet NY 481 midway between the Morgan Rd and Henry Clay Blvd overpasses. A rough hand-drawn map is on my Fictional NY 348 page. Regarding NY 5, there were actually two proposals for the end of the expressway in Fairmount. One, as Snappyjack suggests, would have connected to I-81...but near Nedrow instead of at I-481. The other would have extended an improved NY 5 (either freeway or an improved arterial) east towards downtown Syracuse, with various alternatives considered (upgrading Genessee St, Erie Blvd, new alignment near Grand Ave or Onondaga St, stopping at Geddes St or continuing to West St). Anyone know what happens to NY 45 south of NY 59 near Spring Valley? The NYSDOT route log and traffic data documents indicate it goes to the NJ line but I can't find evidence of its route from NY 59 to NJ on any online or paper source I have access to. 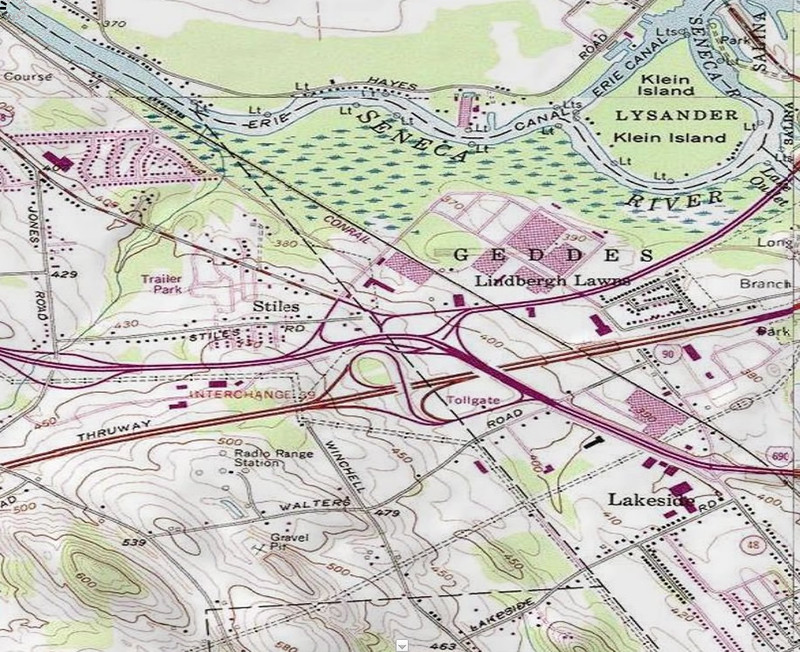 I'm working on the NYS highway system for the clinched highway mapping project. Thanks for the NY 45 info. That seemed like it would be the logical routing. GENESEO - Assemblyman Daniel Burling (R,C,I-Warsaw) announced funding for Livingston County transportation improvements. $3.2 million will be directed to pavement replacement on Interstate 390. Burling called the funding critical to the economic stability of Western New York. The $3.2 million repaving of I-390 will cover 6.5 miles of roadway between Routes 5 and 20 in Avon to Route 20A in Geneseo. To maintain pavement integrity, deteriorating sections of concrete will be removed and replaced. The project is expected to be complete in June 2011. Burling cautioned motorists to expect one lane of traffic in each direction, with a speed limit reduction to 55 mph during construction hours.